We have posted over the weekend on POGO’s letter to President Obama which urged the appointment of a “truly independent and aggressive” Inspector General for the State Department (see POGO writes Pres Obama about State’s Inspector General, urges appointment of a “truly independent and aggressive” IG | November 20, 2010). One of the items in that POGO letter that caught our attention is the mention of the peer review report conducted by the National Aeronautics and Space Administration (NASA) OIG on behalf of the Council of Inspectors General on Integrity and Efficiency (CIGIE), which identified numerous troubling deficiencies in MERO’s performance. The report went so far as to recommend that “State OIG retract any report that fails to meet generally accepted government auditing standards” or GAGAS. According to its website State’s OIG opened its first permanent office outside of the United States January 23, 2008, when the Middle East Regional Office (MERO) began operations in Amman, Jordan. The Assistant Inspector General for MERO is located in Washington D.C.; however the office director is at the U.S. Embassy in Amman, Jordan. It serves as the principal planning and coordinating office for all OIG activities within the regional area from Northern Africa to the Middle East and Central/Southern Asia. The office’s purpose is to provide oversight and assistance for high-cost, high-risk Department programs located in crisis and post conflict areas and countries. If we did not see this in POGO’s letter, we would never have known about it. The peer review document is posted in State/OIG’s website, but it’s four levels deep and unless you know what you’re looking for, you probably would spent tons of time digging in the various report “buckets” that have no central index. State OIG has two Assistant Inspectors General (AIGs) for auditing: one leads the domestic Office of Audits and the other leads MERO. The MERO AIG told us that when his division was first created, he had planned to develop a separate audit manual for MERO. However, this manual was never developed. In April 2009, State’s Acting Inspector General directed MERO to adopt the manual used by the domestic Office of Audits. Consequently, MERO auditors conducting reviews between January 2008 and April 2009 were operating with no officially documented audit policy. 1. Lack of Documented Evidence in Support of Audit Conclusion – We did not always find documented evidence to support audit conclusions. GAGAS requires that auditors determine the overall sufficiency and appropriateness of evidence to provide a reasonable basis for findings and conclusions. The State OIG Office of Audits’ audit manual states that evidence is sufficient and appropriate when it provides a reasonable assurance that the findings or conclusions are supported within the context of the audit objectives. We determined for one MERO report that the evidence contained in the audit files did not support audit conclusions. Specifically, the audit documentation for the report was inadequate and finding summaries were often incomplete (MERO-IQO-09-02, “Review of Diplomatic Security’s Management of Personal Protective Services in Iraq,” January 9, 2009). We also identified two deficiencies in another report: (1) audit steps were not crossindexed to supporting work papers; and (2) auditors did not consistently follow State OIG’s quality control policies and procedures for performance audits (MERO-A-09-10, “Performance Audit of Embassy Baghdad’s Transition Planning for a Reduced United States Military Presence in Iraq,” August 19, 2009). In addition, for two reports we found MERO did not complete quality control checklists or provide other evidence of a comprehensive quality control review to ensure the audits complied with GAGAS (“Review of Diplomatic Security’s Management of Personal Protective Services in Iraq,” MERO-IQO-09-02, January 9, 2009, and “Performance Audit of the Triple Canopy Contract for Personal Protective Services in Iraq,” MERO-IQO-09-03, April 30, 2009). According to MERO officials, its auditors did not include the elements discussed above in work papers because MERO did not begin to follow the State OIG Office of Audits’ or any other written audit manual until April 2009. Accordingly, we could not determine whether MERO audit conclusions were adequately supported by documented evidence in accordance with GAGAS. 2. Inadequate Evidence of Staff Supervision – We did not consistently find consistent evidence of adequate supervision of MERO staff. According to GAGAS, supervision involves providing sufficient guidance and direction to staff assigned to the audit to address the audit objectives and follow applicable standards. In addition, the State OIG Office of Audits’ audit manual states that it is the responsibility of the audit manager to document evidence of reviews to show that the project has met supervision standards. Three reports we examined (MERO-IQO-09-02, “Review of Diplomatic Security’s Management of Personal Protective Services in Iraq,” January 9, 2009; MERO-IQO-09-03, “Performance Audit of the Triple Canopy Contract for Personal Protective Services in Iraq,” April 30, 2009; and MERO-A-09- 10, “Performance Audit of Embassy Baghdad’s Transition Planning for a Reduced United States Military Presence in Iraq,” August 19, 2009) lacked adequate evidence of supervision of staff. Specifically, the level of direction and supervision of staff was inadequately documented in the work paper files. In addition, MERO staff signed and dated almost none of the work papers to indicate they were prepared and ready for review nor did supervisors sign and date the work papers to indicate they had been reviewed. Insufficient Documentation of Audit Planning – We did not find sufficient documented evidence to give reasonable assurance that MERO adequately planned its audits. GAGAS requires that auditors must adequately plan and document the planning of work necessary to address audit objectives. The State OIG Office of Audits’ manual lists several elements that audit teams must document in their audit work paper files to ensure adequate planning of audits, including assessing the risks of fraud, assessing internal controls, documenting relevant laws and regulations, and documenting the audit’s scope and methodology. Based on our review, we concluded that MERO did not consistently include documentation to provide assurance that its audits were adequately planned. Generally accepted government auditing standards (GAGAS) require OIG organizations that perform audits or attestation engagements to have an appropriate system of quality control and to undergo external peer reviews at least once every 3 years. State OIG’s response to NASA (Exhibit B to the NASA report) is included as a part ofthe external peer review report and describes the actions taken and actions planned for 2011 to address the reported deficiencies. Both the report and OIG’s response will be posted on IG’s website. NASA OIG opined that the system of quality control for State OIG’s audit organizations in effect for the year ending September 30,2009, although suitably designed, was not consistently followed by one of State’s two audit divisions OIG’s Middle East Regional Office (MERO). Consequently, State OIG received a peer review rating of pass with deficiencies. Finally, in September 2010, I directed that all MERO activities and functions merge within the Office ofAudits, effective October 1, 2011, ensuring that only one office within OIG issues GAGAS reports. This internal reorganization will not disrupt MERO’s work or change its mission and will result in strengthening our quality control system through adherence to a single standard. OIG staff and personnel will continue to be based in Baghdad, Islamabad, Kabul, Amman, Cairo, and Washington, D.C.
-08/31/09 Performance Evaluation of the U.S. Training Center Contract for Personal Protective Services in Afghanistan (MERO-A-09-08) Aug 09 [360 Kb] This report is currently under revision. -08/25/09 Performance Evaluation of Embassy Baghdad’s Transition Planning for a Reduced United States Military Presence in Iraq (MERO-A-09-10) Aug 09 [154 Kb] This report is currently under revision. -08/25/09 Review of the Roles, Staffing, and Effectiveness of Regional Embassy Offices in Iraq (MERO-IQO-09-09) Aug 09 [233 Kb] This report is currently under revision. -06/25/09 Performance Audit of the DynCorp Contract for Personal Protective Services in Iraq (MERO-IQO-09-06) (June 09) This report is currently under revision. -05/29/09 Performance Evaluation of the Triple Canopy Contract for Personal Protective Services in Jerusalem (MERO-IQO-09-05) May 09 [386 Kb] This report is currently under revision. -04/30/09 Performance Evaluation of the Triple Canopy Contract for Personal Protective Services in Iraq (MERO-IQO-09-03) April 09 [368 Kb] This report is currently under revision. 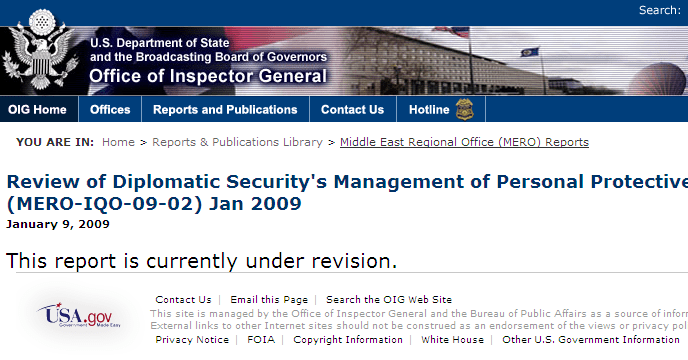 -01/09/09 Review of Diplomatic Security’s Management of Personal Protective Services in Iraq (MERO-IQO-09-02) Jan 2009 [1017 Kb] This report is currently under revision. In a related development — USAjobs.gov has a job announcement dated November 18 (the same day POGO released its letter to the President) for an Assistant Inspector General for OIG’s MERO office. # All groups of qualified individuals within the civil service. Over at the OIG website, an incumbent is still listed as Assistant Inspector General for the Middle East Regional Office. It does not look like this is additional staffing if you read the job announcement here. Does this mean the current AIG for MERO has quit/will quit or has been asked to take a walk? We have sent that question to the OIG’s press shop but have yet to receive a response as of this writing. Image by MJTR (´･ω･) via FlickrWhy TSA did not think of this first, baffles my brain. An iPad would be nice, too. Or anything that’s in short supply this holiday season would probably do the trick (jobs are in short supply, of course, but that may be too tricky for giveaways). Want a turkey? Get touched by TSA (just make sure it’s not a frozen turkey). Want a tussle? Get touched by TSA. But absolutely no biting! Oh, my – one can go on and on with this with a beginning rhymes dictionary. National Opt-Out Day – the day before Thanksgiving – is the busiest travel day of the year. In light of recent controversy, many plan to refuse a backscatter scan at airport security, and instead choose a (fairly invasive) pat-down. Either way, people can count on longer-than-usual airport lines. As a slight gift to opt-outers out there, Loopt is giving away 10 iPod Touches for TSA touching. Just check into your airport on Loopt* on Wednesday, November 24 (with iPhone, iPod Touch or Android), share a bit about your experience, push it to Twitter with the hashtag #touchedbyTSA, and you can win an iPod Touch. That simple. The company Loopt was formed in 2006 “to build mobile applications that use location to help you enjoy the friends, places, and events around you right now.” Loopt offers a suite of mobile applications that run on over 100 different phones and are enjoyed by more than 4 million people.